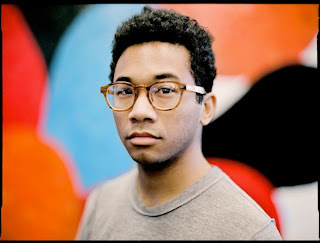 I'm not sure whether Toro y Moi chose the song title 'So Many Details' because this lovely song of his is positively swimming in lashings of details, or if it's just coincidence, but either way, like I said, it's lovely. Musically active for around three years now, Toro y Moi (real name Chazwick Bundick - really) is a mainstay of the laid-back chillwave genre and has already released two albums; this song comes as the first single from his upcoming album, Anything in Return - set for release on 22nd January 2013 - and whilst it remains chilled, there are many textures that make it a delightfully rich medley of sounds. The song begins with a looped, dreamy effect that sounds like the equivalent of a troop of clouds travelling across a clear sky, followed quickly by some clipped and muffled brass-type sounds all bubbling together. Then the beat proper comes in, playing host, for the main part, to a dusty kick drum that underpins the whole, lazy, head-swaying hip-hop mass that cruises along with the the thin falsetto vocals and a soulful yet cartoony and crumbling bassline that warms the soul. There's a hollow, modulating synth breakdown with atonal, glitchy chords before introducing a female vocal sample that floats in like a guest-appearance ghost - lovely touch. But before the end of the song, over halfway through, around the same time as the once intermittent pinging smacks of delayed guitar chords become more frequent, the song descends into an electro trance, the vocals become more echoing, high-pitched bleeps cascade around and - happily - frantic tribal drum sounds circulate underneath all the mayhem. Wow. If you listen to that song properly (and NO, I don't mean stoned, like 80% of YouTube comments on 'good' songs suggest) it takes you away to some faraway electro playground that isn't cold, dark or damp, but warm, colourful and made expressly for you.